From dining halls at major universities to quaint rural school districts - Great Lakes Beverage Distributors has the equipment to get a premium slush product up and running with no up front costs or contracts. 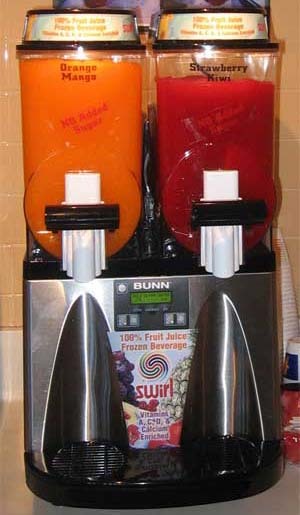 Everyone loves the taste and with our 100% fruit juice slush now schools are able to meet the strict nutritional requirements mandated by state and federal nutrition guidelines. Call today to set-up a free sample day for your team members, district faculty, and student body. - Bowls in polycarbonate plastic are easily removed to facilitate cleaning. - Slush density settings can be regulated for each bowl. - One bowl can also be used as a cold drink dispenser. - Double covers to make bowl filling easy. - High chilling capacity for quick and efficient production even in the hottest weather. - Over-freeze cutoff switch to prevent damage to augers. - Individual bowl controls for freeze and auger controls. Patented reversing auger design quickens freeze time and reduces air mixing. Very simple to program and run with touchpad display, which also guides cleaning and preventive maintenance. Large 3 gallon (11.4 litre) hopper for optimum cooling and serving capacity.